This week on the Biblical Editorial Review. 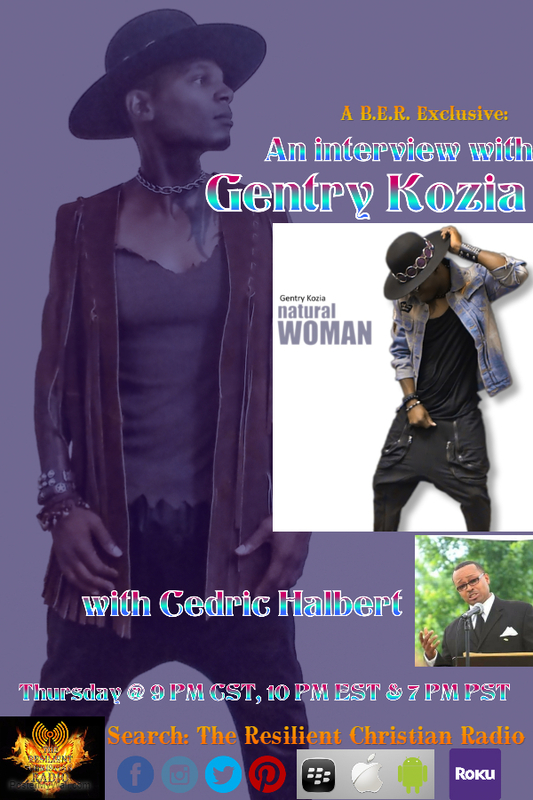 We are interview“Gentry Kozia and Cedric Halbert of Natural Woman Challenge”. Gentry Kozia is a very motivated and driven artist working diligently to spread this phenomenal song that celebrates the inner beauty and strength of women. Soul singer Gentry Kozia drops his first single “Natural Woman” a song celebrating & uplifting all women young and old. A mixture of vintage soul & Hip hop then add the silky smooth backgrounds with Gentry’s distinctive raspy but polished 2nd tenor vocals and you get a sound that missing in today’s music. Minister Cedric Halbert, Gentry Kozia's manager, a Spirit Adviser for Gentry and a minister that have an outreach ministry that Spreading Positive & Non Derogative Music for the next generation. Please join us on this Thursday for The Biblical Editorial Review @ 7 PM CST, 8 PM EST, and 5 PM PST (Live) & 9 PM CST, 10 PM EST and 7 PM PST (Re-Aired).